This site is dedicated to providing photographs and other information on American Seacoast Defenses of the modern era (i.e., 1890s to WWII). In presenting this material I will assume that you already know a bit about the subject and not explain all of the basic concepts. That said, I hope you find the information presented here enjoyable and enlightening. The various installations are sorted by which Harbor Defense they are located in and then by installation type (although there is a location list provided as well). Please take a moment to read the Disclaimers and Conditions of Use page and also the Thanks page. 2/15/07, Uploaded a partial copy of the 1942 Local Harbor Defense Board Proceedings for Seward Alaska. 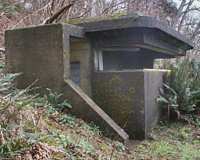 10/22/06, Uploaded the last page from the 2005 Kodiak visit: Searchlight #22 at Fort Abercrombie. 10/14/06, Added two pages: BC 6 and B 1/6 S 1/6 and the Battle Allowance Magazine, both at Fort Abercrombie. 10/2/06, Uploaded a page for the Battery Const. #404 plotting room at Fort Abercrombie. 9/26/06, Added two pages for Battery Const. #404 at Fort Abercrombie.